2:a fabulous animal usually represented as a monstrous winged and scaly serpent or saurian with a crested head and enormous claws. Tormont Illustrated Encyclopedia: drag'en n. 1. a. A fabulous monster, represented usually as a gigantic reptile breathing fire and having a lion's claws, the tail of a serpent, wings and scaly skin. b. A figure or other representation of this creature. 2. Archaic. A large snake or serpent [Middle English drago(u)n, from Old French dragon, from Latin draco (stem dracon-), dragon, serpent, from Greek drakon, serpent. What are dragons? Where do they come from? What is their history? © Draconian.com 1996-2010, do not use without permission! PHYSIOLOGY: Thick, long bodied, scaly skin, four strong legs, two bat-like wings, wedge-shaped heads, and long necks. They usually are portrayed as breathing fire. Some breeds of these dragons have been known to be shape changers, and others have the chameleon power to change color of their background. They are sometimes displayed as having a spade or spiked tail. They eat but once a month on a sheep or ox, or even a human (myth says they prefer virgin maidens). They can be any color, or many colors, depending on the breed of the dragon. See the dragon Physiology page for more info. , Beowulf and the Dragon, and Draco in the movie DragonHeart. Some stories have the western dragon as the Devil in Christianity. Other stories in legend say that eating a dragons' heart will give the consumer the power of understanding birds, eating the dragons' tongue enables the person to win any argument, and rubbing the dragons' blood on skin will protect against stab wounds. Another myth references Vlad Drakul to mean Son of the Dragon, or Devil. The end of the dragon came with Christianity, and knights that were eager to prove their faith. 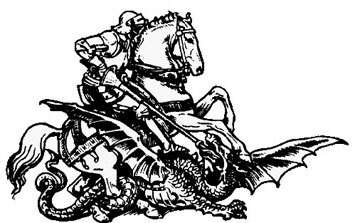 The knights quickly discovered that dragon-hunting was very profitable, and soon most the dragons in the world were destroyed in a very short time. Vikings had dragon figureheads on the prow of their ships. The dragons on the ships were believed to endow keen site and cunning to the Viking warriors. Today the Welsh flag still has a red dragon on a green/white background, and the red dragon is their national symbol. PHYSIOLOGY: These three species of dragons look very similar, but come from different parts of the world. They all have sinuous serpentine bodies, have four legs, they do not usually breath fire, usually shown not to have wings, but are illustrated to have them which is the Adult Imperial Dragon. The dragons are said to be made up of many different types of animals of the Earth: the body of a snake, scales of a carp (fish), head of a camel, horns of a giant stag (deer), the eyes of a hare (rabbit), ears like a bull, a neck like an snake, belly of a clam, paws like a tigers, and claws like an eagle. Most of the time they are shown to have a lion-type mane around its neck, on its chin, and on each elbow. They have two antler-type horns decorating their wide-mouthed head, and two long "feeler" whiskers spreading out from their snout. Eastern dragons have 117 scales, 81 infused with yang, the good, and 36 infused with yin, the bad. This evens out the dragons temper and personality. There are three families of Eastern dragons: 3 toed, 4 toed, and 5 toed. Three toed dragons are Japanese. Four toed dragons are Indonesian or Korean. Five toed dragons are Chinese. They are shown in the colors blue, black, white, red, or yellow. Oriental dragons are usually shown with a pearl in their mouth, under their chin, or in their claws. This is apparently where the dragon gets its power, and how it ascends to heaven. Roasted swallows are the Chinese dragon's favorite food. HISTORY: In China dragons are known as Lung. There are four main kinds of Lung: Tien-lung , The Celestial Dragon: who protect the places of the Gods, Shen-Lung, The Spiritual Dragon: who control the wind and the rain, Ti-Lung , The Earth Dragon which control rivers, and water on the Earth, and Fut's-Lung , The Underworld Dragon which guards precious metals and gems. Separate dragons control the rivers of the North, South, East and West. The commander of all the River Dragons is Great Chien-Tang who is blood red, has a firey mane, and is 900 feet long. Eastern dragons are portrayed as good, kind, and intelligent. Oriental Dragons have the most recorded history in the world, especially in China going back thousands of years. In history they have a very close link to the weather. It is said that some of the worst flooding in Asia's History were caused when a mortal has upset a dragon. In Chinese history, the 5 toed dragon is the symbol of power, and are considered "Imperial Dragons". Long ago, it became law in China that only the Emperor could have a five-clawed dragon displayed on his robes or illustrated on anything the Emperor owned. It was usually a Yellow dragon, thought to be the most superior of all the colored dragons. If someone other than the Emperor was caught wearing the symbol of the 5-toed dragon, he was put to death. More about the Chinese Dragon. Eastern dragons are still shown in parades around the world celebrating the Chinese New Year with the Dragon Dance. Learn more about Eastern Dragons, follow these links! PHYSIOLOGY: Very small dragons, being only 1'-5' long, any color, with large eyes, and large butterfly-type wings. These dragons are vegetarian as they only eat fruit, vegetables, nuts, and so on. HISTORY: These are the rarest of all the dragon, as only a few have ever been reported. Some myths might come from some large butterflies that are around the world. It is said in legend that these dragons sometimes carry faeries from city to city. Since only a few have ever been seen, the history of these types of dragons are next to none. PHYSIOLOGY: These are dragons which have two wings, but only two legs. Sometimes shown as having claws on the wings, acting like another pair of "hands". The Wyvern is sometimes depicted as having a razor sharp stinger filled with poison on the end of its tail. HISTORY: The history of the wyvern seems to come from Europe. The history of this dragon is not so clear, it seems to be mixed in with the history of the 4-legged dragon. Wyvern's have been depicted in heraldry on shields and banners for hundreds of years, and is considered a sign of strength to those who bear the symbol. One of the more famous wyverns is Vermithrax in the movie DragonSlayer. PHYSIOLOGY: These are dragons which have multiple necks and heads. They may or may not have wings or legs. HISTORY: In Greek mythology Hercules fought a grand hydra with 8 heads (history tells us 6 to 9 heads for this particular hydra). Every time he managed to slash one off with sword, two would come in its place. He finally figured out by burning the stump with a torch, it could not grow another head. That is how Hercules rid the world of the mighty hydra. Also in Greek mythology, Jason killed a hydra to get the Golden Fleece. PHYSIOLOGY: These dragons have four legs, and two wings. They have smooth, leathery skin without scales. The dragons eyes are compound and faceted like a fly's that can change color depending on the mood of the dragon. They have a telepathic abilities with other dragons, and their rider. Pernese dragons can also teleport into "between", which is a void, to escape danger. Gold and green dragons are Female. Bronze, brown and blue are Male. They can breath fire by first swallowing a certain type of flammable rock known as Firestone. Read more about Pernese Dragons. HISTORY: The colonists of Pern (A world created from the stories by Anne McCaffrey) genetically engineered these huge dragons from their small cousins, Firelizards. Pernese dragons and their riders have a life-long relationship, this is started at the Impression. This is when the dragons hatch and choose their human partner. If the human partner dies without the dragon, the dragon will go between permanently. If the dragon dies, the human usually wastes away until they pass on. PHYSIOLOGY: This is a Western-type dragon with only legs and no wings. There are two types of drakes, Fire and Cold. FireDrakes have the breath of flame, and are usually reddish in color. ColdDrakes have the breath of snow and hail, and are usually white or light bluish in color. These types of dragons do not fly, they look like large lizards being about 4' - 40' long. HISTORY: This dragon has links to the Western dragon in history, but no solid history has been produced. Sometimes young western dragons are mistaken for drakes because of the lack of wings until they reach maturity. In Europe there are many cities named after this dragon: Drakeford, Drakeshill, etc. PHYSIOLOGY: These are dragons with only wings. HISTORY: The most famous amphiptere is Quetzalcoatl (kwet-zah-coat-al), the winged and feathered serpent god from Mexican history. Scientists think that the myth of Quetzalcoatl started with a bird, the Quetzal. This bright green bird has tail feathers of over two feet long, and when it flies, the bird looks like a shimmering serpent. PHYSIOLOGY: These are dragons which have no legs or wings; Or sometimes referred to as a very ancient dragon. Also known as The Guivre (Gy-veer). HISTORY: These dragons seem to have originated in England, and are said to live in forests and wells. They love any place near water.There are many famous worms in England's history, the most famous perhaps is the Lambton Worm. This is about an Heir to Lambton Hall in England who caught the small worm, but thought it too ugly to eat, so he thew it in the local well. Over the years the worm grew to enormous proportions and left the well to harass the locals. When Lambton came back from a war to see the horror he had created, and was told by witch he must slay the worm, but also must kill the next creature he saw. He slayed the worm, but unfortunately, the next living creature he saw was his own father, of whom he could not kill. It was said that the Lambton family was cursed for the next nine generations, and doomed to die abroad, and never at home. PHYSIOLOGY: These are dragons which have two legs, and no wings. They usually have very long tails, and short legs. HISTORY: Lindworms were apparently discovered by Marco Polo while crossing Central Asia. He described them as, "Swifter than it looks. Easily able to take down a man on a galloping horse." 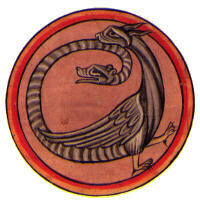 These types of dragons (along with the Oroboros) are frequently represented as "prima materia" in the first stage of the Alchelmy process. PHYSIOLOGY: These are dragons that live in water, fresh or salt. HISTORY: Since man has been sailing on boats, sea serpents have been in history. These creatures were shown on maps early in European history, where unknown territory was marked "HERE BE DRAGONS". Some scientists believe in what these sea serpents sailors saw were actually gigantic squids, large masses of sea kelp, or even seafaring dinosaurs. The Basilosaurus had a very long body, and short neck, its mouth filled with long sharp teeth. If it came out of the water near a boat, it could very much be thought of as a sea serpent. "Nessie" the Loch Ness Monster in Scotland, is one famous "sea serpent". PHYSIOLOGY: This is a dragon who holds its tail it its mouth. HISTORY: First discovered in Egypt, and later in Greece,it is the symbol of the universe. It also is sometimes referred to being the symbol of "eternity" or "never ending". The name Ouroboros means "tail eater". A similar dragon is his Norse cousin the Midgard Serpent whose huge body circles the entire world. He was also known for biting his tail, when he was not trying to bite the Norse god Thor, whom was eventually killed by the gigantic dragon. PHYSIOLOGY: This is a dragon that has two heads, one in the front of the body, and one at the tip of its tail. With one head holding the "tail-neck" it can roll around in any direction in a hoop. It is usually portrayed as having a scaly body, feathered wings, and feet of a rooster. It's name means "one that goes in both directions". HISTORY: This dragon originates from Africa. Stories say when the female amphisbaena was looking over her eggs, she could keep one head awake at all times. Today, there is a lizard named after this dragon which has markings on its tail that look like a head. When threatened, it lifts its tail and scatters back and forth to confuse its attacker. PHYSIOLOGY: These are pseudo-dragons who are usually portrayed as having a human head and serpentine body, and no wings. Dragons have been in mythology and legend for thousands of years. Almost every country in the world as some sort of dragon story. Where did they originate from? Did people actually SEE dragons? By some strange chance, were their dinosaurs still roaming the earth only a few thousand years ago? Were some of the dragons people saw actually lizards that have extra skin, and can glide such as the Kuehneosaurus,or the flying dinosaurs the Archaeopteryx or Pterosaurs? Maybe, but these are questions no one can answer. Dragons will always live on the Earth, we do have real dragons here! There is even a genus of lizard called draco. Two "dragon" lizards are water dragons, and http://www.bagheera.com/Komodo dragons. The water dragon is a popular small lizard to keep as pets. The Komodo dragon (not discovered until 1912!) is the largest known lizard today, reaching lengths of 10 feet, and 150 pounds. The bright yellow tongue could be mistaken for a flame, and its vicious nature would scare anyone away. Some other "dragons" are the Dragonfly, and the Snapdragon flower. The Dragonfly could have been mistaken for a small flying dragon in the past, although, in Jurassic times, Dragonflies were as big as a seagull. The Snapdragon flower looks like a red mouth with a gaping yellow throat, which could be where it's name came from. Humans have even named one of the Constellations in the sky Draco for the shape of the constellation is that of a dragon. So, why dragons? Is it their powerful presence? Are they watching us without us watching them? Some people think so. But until a dragon wants themself to be known, they only show themselves to those who TRUELY believe. Dragon stories and myth have been around for thousands of years, so it isn't going anywhere anytime soon. It is almost certain that more myths and legends of these fascinating creatures will fill the heads of children and adults alike and artists will continue drawing, painting, and creating dragons of all sorts, as long at their imaginations takes them to the realm of the dragon. Here Be Dragons! hopes that this study has opened your eyes to what dragons are, or what they could be. We also hope that this encourages you to write a dragon story, draw a dragon picture, or create your own dragon web site. All of this is what a dragon is. How do YOU say Dragon? This is an original document. This page has been taken, and spread around the web WITHOUT permission. Please report any page that resembles this one in content. 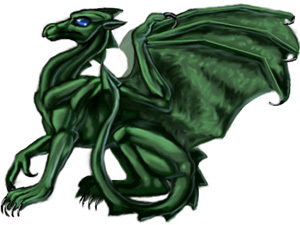 Kuehneo.gif from page 94 of Dragons: A Natural History by Dr. Karl Shuker. Worm original artwork by Michael Whelan. Pernese dragon art by Dee Dreslough. Faerie Dragons by Jennifer Walker.